Have you had enough Coffee yet? One more card using this fabulous Coffee set from Verve! 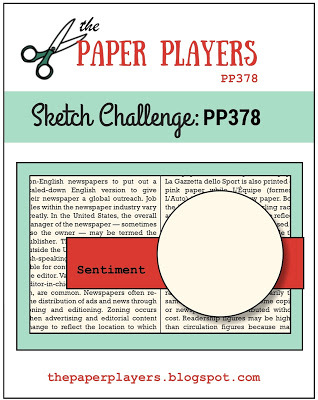 This time I am linking up to The Paper Players Sketch Challenge. I decided to make my card Vertical instead of Horizontal. I always have a devil of a time photographing horizontal cards. The square stitched dies are SU and the heart banner die at the base is Verve as well. I made my own background paper once again. I believe the Apricot polka dotted paper is from Bo Bunny, but don’t hold me to it. 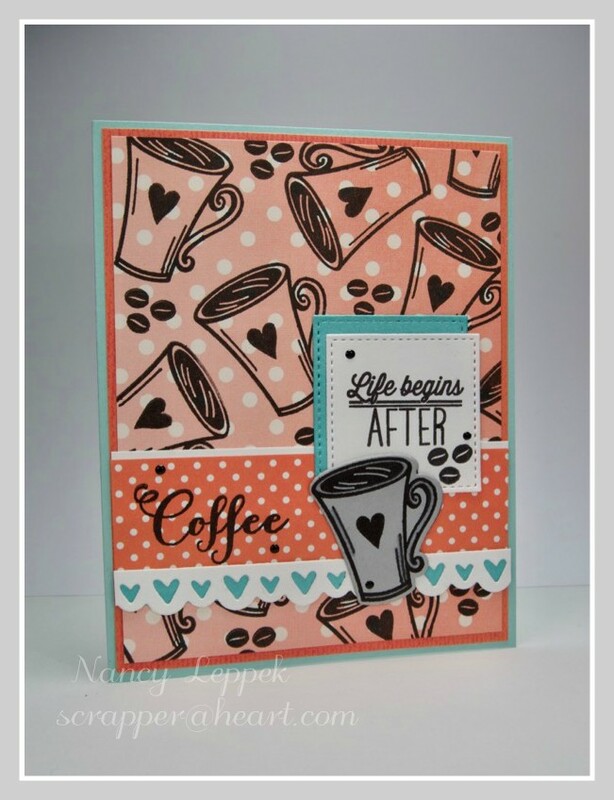 Categories: Cards | Tags: Card making, Cards, coffee lovers, rubber stamps, sketch challenge, Verve Stamps | Permalink. Really cute card. Enjoy your coffee. Hope you aren’t sick. Great coffee card and I always like a cuppa! I ADORE this card….that paper is fabulous! Did you stamp the coffee cups on the apricot paper? I would love to know the maker of that paper….it’s awesome and looks amazing with the coffee theme as well as the turquoise accents! One of my favs, thanks so much for sharing it with the Players this week! Yes LeAnne! I stamped the cups on the Apricot Polka dotted paper. I am pretty sure that the paper is from Bo Bunny. Thanks for the sweet comment. I think your DIY DSP is superb! As I’m sitting here with my first coffee of the day, I can’t help but agree with the sentiment. Thanks so much for joining us at The Paper Players this week. You are making such wonderful use of this stamp set, Nancy! You really rocked this one, love the background you created and how you turned the sketch. So happy you shared with us at The Paper Players! I love the idea of stamping on DSP to make your own background, Nancy, and this looks great with the coffee cups.